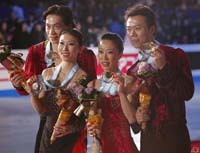 An inspired, but not flawless performance by Shen Xue and Zhao Hongbo has given China its first ever Olympic gold medal in figure skating. Buoyed by a record-setting short program heading into Monday's action, the three-time world champions in pairs figure skating scored 139.91 on their free skate for a total score of 216.57. The husband and wife team, skating to "Adagio" choreographed by Canadian Lori Nichol, won bronze at both the 2002 and 2006 Olympics, and came back from a three-year retirement for one last shot at Olympic gold. The gold-medal performance snapped a Russian stranglehold on the top of the podium that stretched back to 1964. Canadians Jamie Sale and David Pelletier shared gold with Russians Elena Berezhnaya and Anton Sikharulidze at the 2002 Salt Lake Olympics, though the case was rather scandalous. Canadians Barbara Wagner and Robert Paul were the last non-Russians to stand alone atop the podium, in 1960 at Squaw Valley. China's Pang Qing and Tong Jian actually had the best routine Monday, scoring 141.81 on a flawless free skate, but they had to settle for silver after finishing fourth in Sunday's short program. They had a total score of 213.31. One of the declared favorites - the pair of Russian figure skaters, Alexsandr Smirnov and Yuko Kawaguti became fourth in their first Olympic games. The Canadian Press has contributed to the report.